We spend lots of time on our patio and porch all year round. And since we have a fire pit, fall and winters are perfect for a roaring fire roasting hot dogs or marshmallows. And a blanket is a must to keep us toasty! The problem with blankets around the wood fire is they smelled like smoke and they carried that smokey smell into our home. I’ve solved the problem by making cozy flannel blankets just for outside sitting! This is such an easy diy! These blankets can go into the washer and dryer without worrying if they will shrink or fade or be ruined. And one more added bonus… I am making them in colors that work with my outdoor decor! I used ordinary flannel from our local fabric store. It had a nice weight to it! Here’s the beauty of this cozy flannel blanket… you can make it any color, size and weight that works for you. If you want a very light blanket you can sew up the blanket without any interfacing. If you like a mid-weight blanket you can use a mid-weight interfacing and if you, like me, want a warm blanket you can use a heavier interfacing! I made this blanket for my back porch swing! You can find me here at some point almost every day! This blanket is 44″ x 71″ and is a heavier weight. Just right to be used as a large lap blanket. I have a couple more blankets to make this weekend… and another fun thing make to keep us warm outside that I’ll share next week! 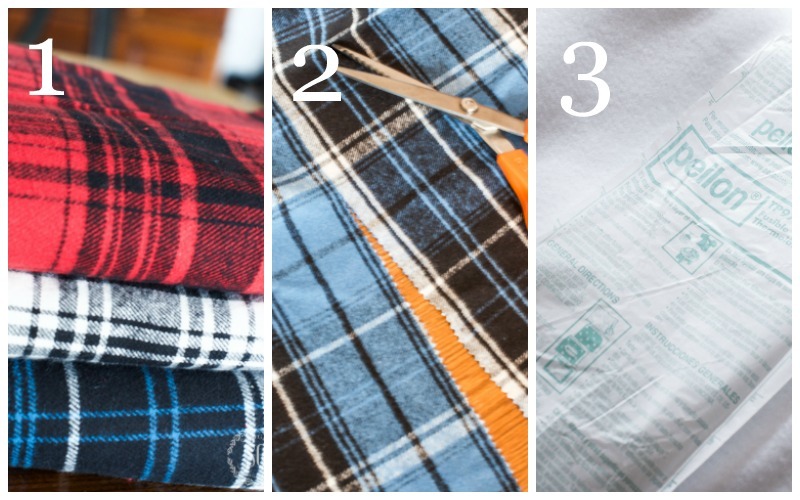 Let’s make a cozy flannel blanket… here’s how! Make sure you wash and dry flannel before you sew it. This will pre-shrink the fabric so when it’s made into a blanket it can be washed and dried. Fold the material in half so it measures 45″ x 72″. Cut the fabric in half along the fold. Put the Pellon interfacing on top of a half piece of flannel (wrong side up) with the interfacing rough side down. 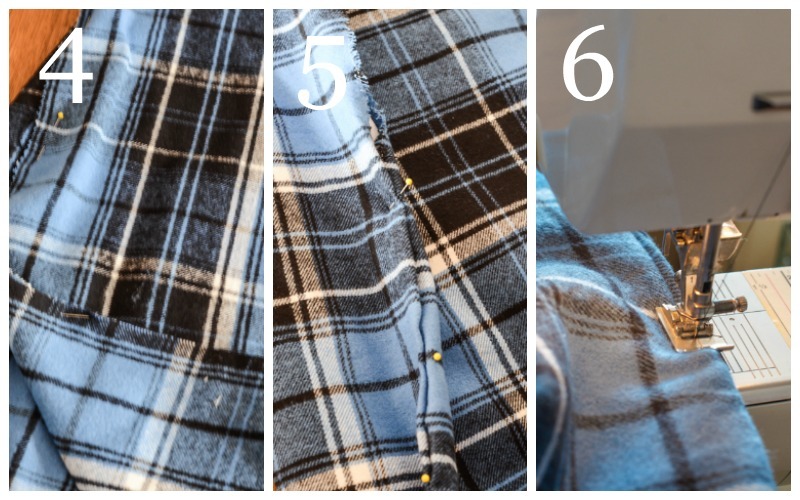 Pin together and iron the interfacing to the flannel piece according to directions. 4. When the interfacing has adhered to the flannel, put the piece of flannel that was not ironed to the interfacing down on a flat surface with the right side facing up and put the other piece of flannel interfacing side up on top of it. Pin all the edges together. Sew all edges with a 1/2 inch seam allowance leaving 1/4 of one side open. Turn the flannel to the right sides. 5. Turn under the raw edges of the unfinished side 1/2″ and pin together as shown above. 6. Sew a 1/4 inch seam around the entire blanket including the turned under side. You have your very own person blanket! Wouldn’t you like to make a blanket or two or three for fall and winter? Looks like awonderful easy and quick way to make a flannel blanket. Thank you! What a darling gift! Certainly a gift of love! Made this last night. Haven’t worked with interfacing much but I used the heavy weight Pellon interfacing you suggested and after a wash it feels stiff rather than “heavy”. Does this go away once “worn in”? Thanks. Yes, It still has body but it feels nice. I love this blanket and can’t wait to make it! I am new to sewing so can you tell me the purpose of the fusible interfacing? Also, what can I do to make the edges a little more “finished” looking? Thanks! What a great gift idea! I am not much of a sewer but these seem easy and a great way to personalize a gift. Thanks for posting this on your blog. I love the blue flannel that you made your blanket out of, it looks so warm and cozy. Can’t wait to make this. I would love to sew again. This is so simple!! Hardest would be finding the plaid fabric!! Not sure I’ve heard of fleecy interfacing that one irons on but I’ll go for it. Maybe!!! We are cutting back on the gifts ? due to we are older now. And a stroke and seven serious surgeries for hubby in two years. Thie kids even step grandkids are long past high school–not little–so maybe this might work for one or two of them!! I think they all would love them, regardless of their age. Take care. The only thing that makes me more giddy than plaid is plaid flannel! I sew all the time, but it still inspires me to see something someone else has made. Thanks for the “warm” inspiration. With winter right around the corner, this flannel blanket is just what I need. I love the feel of flannel while watching tv, or just curling up with a good book. Durning winter months, I always put flannel sheets on our beds. Thank for this lovely post. Love this idea. Thanks for sharing – pinned it too! Love this idea. It’s a change from the fleece blankets & more economical! Would make nice Christmas gifts, tailgating gifts or even wedding or shower gifts. Perfect to have in our truck for the fall-winter season. 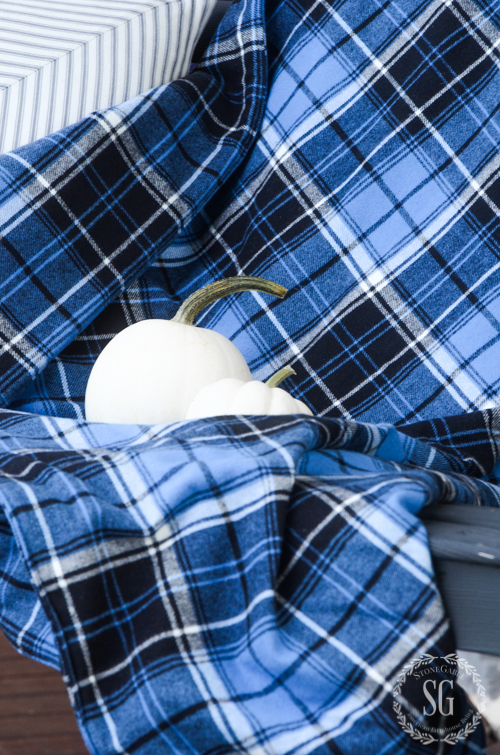 As it’s been difficult to find plaid blankets that don’t cost an arm and a leg or are the wrong colors, this couldn’t be more timely! Gonna make me a couple or three to use outside! Thanks for the great tutorial. Hope you are having a great week! Thinking tail gating/school colors. In our family, flannel blankets go way back ~ at least 40 some years when my mother and grandmother sent a huge box of flannel receiving blankets and padded floor blankets they had made for our first baby. So sweet with crocheted borders all around. Far away from home and family, I treasured them. They were soft and durable, holding up to all the washing required by babies. Mama loved travel but not flying. And for the rest of her life she always had a bag of blankets to finish with crochet borders. On long flights, her seat mate often was the recipient of one of those baby blankets. As her grandchildren headed to college, she made large blankets for each. And I know at least one great-grand who travels with her blanket; she picked the fabric when she was a toddler and now it is with her at college. Mama’s gone but her granddaughters are trying to carry on the flannel tradition. Thank you for your carefully thought through instructions and inspirations. Flannel blankets rock! Love your post, love the blanketsn!! Thank you for the how too’s . I’m going to pin this as I have to replace my sewing machine.. ? But fusible web and then a hand stitch would work!!? 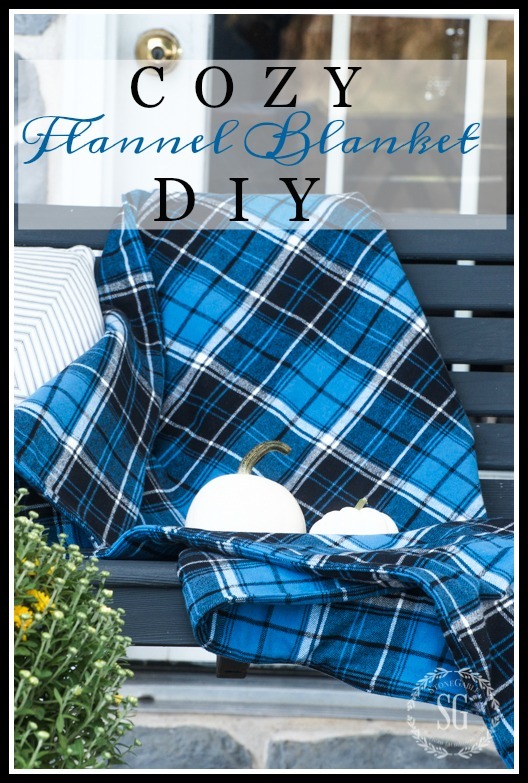 Love your flannel blanket; the instructions will be easy to follow! I have enjoyed the comments to this blog today! (There are SO many!!!) Love the idea Mary had of making a small matching blanket for an American Girl doll! Happy fall! 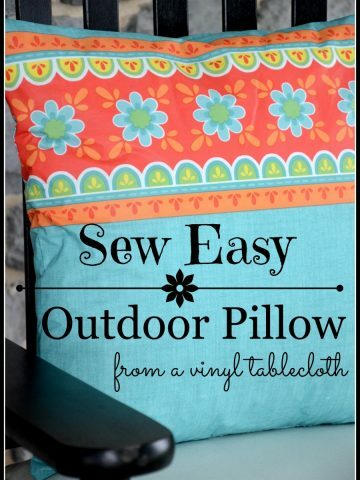 I love this…..really need to pull out my sewing machine that has been in the box for years! Fall is here. Everyone can use a warm blanket!! What a wonderful project for those cozy times outside! Your swing and blanket are calling my name!! Thank you for sharing this! Now I know what to do with some beautiful flannel I found at Joanns yesterday. As a NC girl living in northern Indiana I’m always looking for ideas on keeping warm. I love your blog! This would be a wonderful gift for my youngest son. He loves flannel sheets and comforters .He would be so impressed with this. This came out really nice! I never thought of using interfacing for a blanket. I’ve made blankets as gifts, and I should (finally) make one for me!! 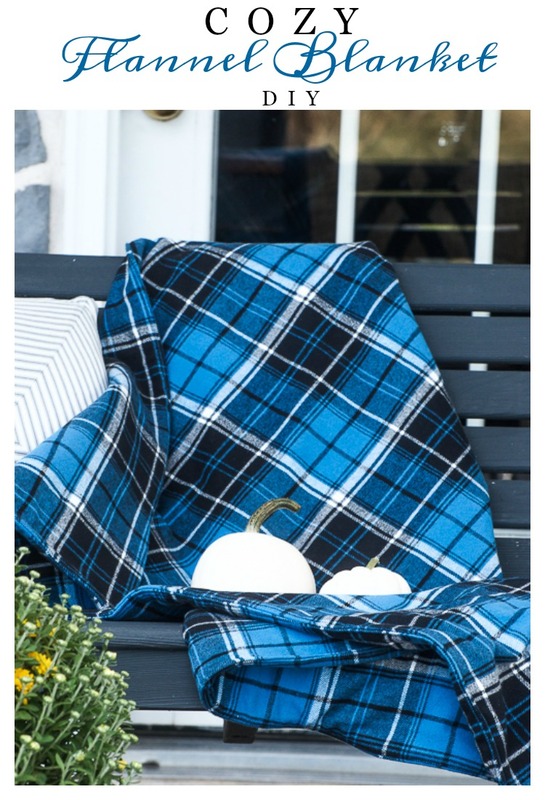 Isn’t plaid just perfect for outdoor deco! I would use quilt batting between the two layers of flannel. I LOVE this blanket idea! That said, I do not have a sewing machine, and do not plan to get one, since I am not into sewing (and know that I won’t be changing that). Even so, I love this idea and am going to try an experiment. I am going to use fusible Hem Tape, and see how that does. ?!? Thanks for the inspiration! Beautiful job, beautiful color. Your tutorial, was very detailed, and yet so simply and helpful, even a lay person (do not no how to sew). Can mak this. Thank you so much fr sharing. This is the best. Everything about it, especially the color is great. My granddaughter is learning to sew–she would probably love a matching one for her AG doll, too. Love this blanket and love the idea of giving as gifts! I have never used our sewing machine, but I am going to learn and get busy for Christmas gifts. I am so excited to give this a try! Absolutely perfect! I am currently living in Germany so no Joannes here, but I am sure I can find some flannel. I will be pi Ning this! This is beautiful! Perfect for autumn evenings…. and they would make nice gifts to friends, teachers, co workers etc. Love it, super idea and so easy. Heading to buy fabric first thing tomorrow ! What a fabulous idea! Girl, you keep me busy, lol. Thank you for the great idea. Love the blue plaid! gorgeous blue plaid! Unusual! Instead of interfacing maybe lightweight “warm and natural” quilt batting? A little more work maybe, but the blanket would be extra warm! Wonderful simple, easy idea for Christmas gifts. I LOVE the blue fabric! I, too love your colors and this cozy project! I also especially loved reading all the comments left by what feels like a community of friends! Don’t you agree, Yvonne ? Wow Yvonne you have wonderful taste. What a great project and a great idea for Christmas presents. Love the plaid for fall. Can’t go wrong there! Thanks for inspiring me again and again!! Nice idea Yvonne, but I’m not that motivated! I’ve been thinking about getting covers to protect the cushions. Thanks for the great idea! This will be on my “to do list” for this weekend. Yvonne, love the idea of making my own flannel blankets in my own colors. I don’t typically gravitate to the typical fall colors of all of the orange tones so have steered away from buying blankets in the fall. Thanks for sharing this idea of making your own…and the directions! I love this! I can’t wait to get into my craft studio and start sewing again. I’ll be making a couple of these cozy blankets for sure! Great tutorial! Can’t wait to make one! As others have said;I’m off to the fabric store to make these for my porch, my sisters, my nieces and my son! You just made my Christmas gift giving soooo much easier. And a bonus, they all love getting something homemade! !And you made the instructions so easy. Thanks for the great idea. Wouldn’t they be amazing with a big monogrammed letter? What a great idea! I can’t wait to make some for the whole family. This would be wonderful for gifting! What a really good idea! We love sitting by our fire pit and on our porches. Love the flannel blankets and love your blog for so many wonderful ideas. 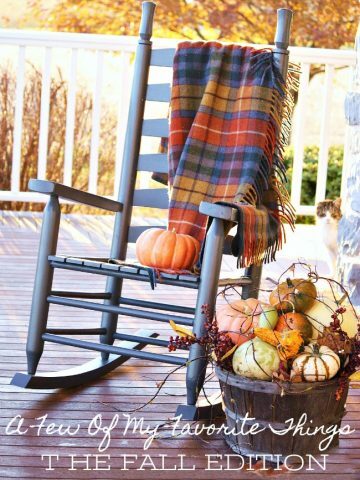 Once again, Yvonne did it……..that blue plaid, flannel will feels so cozy relaxing in the cool evenings…. Love this plaid!! It has such a fresh and unexpected touch for Fall. Love this!! Going make next week!! This is a great idea! I’m always cold. I will do it! This is such a great idea for presents 🙂 I love it. What a great idea! Wish I had one of these blankets for all the fall ball baseball games and cross country events I went to all these years! They would be perfect, Julie! What a great cool weather project. Now where is that cool weather? Great idea! I’ve almost forgotten how to sew. I need to learn how to saw – LOVE this idea! I am going to make a flannel blanket for sure! I always did the cutting, pinning, and pressing when my mother and I made something, but never really tried to sew much until last year. I always watched her. Now she is in heaven, and I have made new draperies, a bed skirt, a new shower curtain and box pleated topper! I think she would be kinda proud of my sewing. I was so particular, that all of the patterns in the fabric matched perfectly. It took me a while, but I did it! Believe me, if you determine you want to make something, you will do it! I am pretty proud of myself too! Yes, half the battle is being determined! YOU GO GIRL! Love your blankets! Where did you find your fabric? Have made baby blankets and just put the flannel back to back and hemmed edges. They are awesome because the more you wash them the softer they get! Thank you for all your great info! You are just so clever! Thanks for a great idea. Love the plaid and the color. Even the beautiful pumpkins. If I’m down, I just go to your blog and I have such a nice feeling. I’m past the times of “why can’t I do that?” Now I just enjoy. Thank you!! Thank you so much for letting me know StoneGable is a bright spot in your day! StoneGable’s post are to inspire you! Hi again, Yvonne – as you may see, I already Commented but forgot to ask the following: why do you use interface? Thank you. I’m a blanket baby. Love, love, love cozy blankets. Perfect idea for a cool fall day. Love that and the plaid! I have made several fleece blankets using doubled fleece with no interfacing and they wash up easily also? We have a small front porch. This would look nice jn blue flannel. 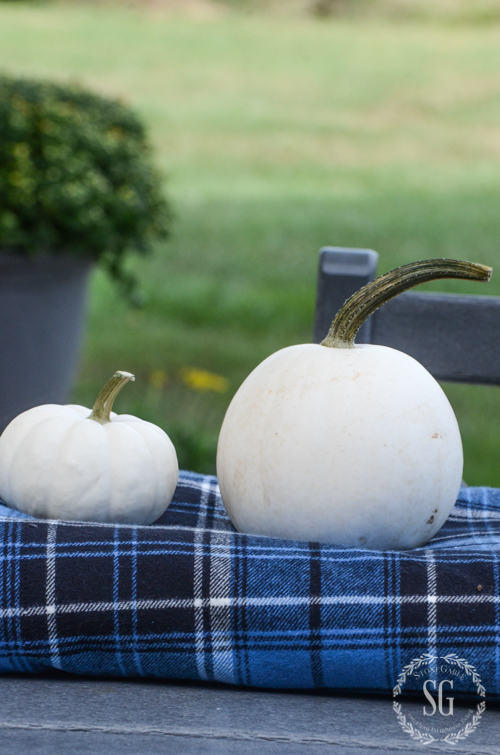 I had painted some of my white real pumpkin’s with blue in the veins. Love the blue plaid color. I too wish I knew how to sew. I love this Yvonne! I can’t wait to look at fabric and I know I won’t be able to walk out of there with only one pattern. But it’s what I love and it makes me happy so that makes it okay in my book! Don’t you agree? Yes I do! Wouldn’t these flannel blankets, like some of our StoneGable community suggest, be great gifts! Such a great idea! Love the flannel, looks so nice and cozy! Thank you for your great idea! Very pretty, Yvonne and I love the blue. Up to now, I’ve bought men’s plaid flannel shirts at the Salvation Army, washed them then cut them up and made patchwork outdoor blankets. I do the reverse side in a denim or corduroy or a solid flannel sheet – whatever strikes my fancy and looks nice. I love this idea! These look much more festive than the cheapy fleece throws I have been using outside. I’m not a great seamstress but I think I could do this. Love flannel! Thanks for the idea! That is such a great idea for an easy blanket! Even though I live in Arizona we do get chilly nights. I’m definitely going to try this blanket idea. I love the fabric you chose for your blanket. I don’t sew (but have a sewing machine! ), but I really think I could make this! Maybe I will try…. and we have so many choices of such beautiful fabric … Not sure I understand the need for the interfacing – was this for body in the throw or for warmth. Thanks for your reply, if I can ever find it. The interfacing does add body, but I use a fleecy interfacing for warmth. It gets cold here! Love this idea. If I had small kids, I would even use these inside while they are watching tv. Great idea and so easy! Thanks! Love the blue flannel! So pretty …..and practical as well! I love your blanket plus the simplicity of this DIY. Thanks for sharing! Thank you for the easy instructions. Great idea. Question….is the fusible interfacing to give it body? Also, does it stay stuck through washings? This is what I’m wondering too. I’ve only used it in lapels, collars, etc. What a wonderful idea for a Christmas gift. You could use a red/green plaid. This is great that you can choose your size. I love your plaid flannel. Good idea! I am so thankful that I learned to sew in home ec. It has come in quite handy. Oh goodness! I remember my home ec days! My mon taught me to sew on an old Sears machine. Love it love it love it!!! Thank you for the Christmas inspiration! Oh how I love this pretty cozy flannel blanket! I pinned it for later reference. I will be sewing one or more of these pretty blankets in the very near future. This will make wonderful Christmas gifts for family & friends. And since it is so easy to make I will be giving these for gifts this year. Yvonne I pinned your post, but I would love to see a print button on your page so the instructions for your wonderful projects could be kept before me in an easier way. This is the first day of Fall and what a wonderful project to start sewing! Gotta go to the fabric store to select my pretty flannel! Thanks again for all your wonderful ideas!! Thank you Louise! I LOVE my pinners! PERFECT! This is exactly what I need! This could be used in the home also! Throws can be expensive! Thanks Yvonne! I love this idea! I wish you would make it so that your instructions are printable. Whenever I print something to save, it has block-ups printed over half the page. Would love to be able to just print out the instructions to take with me. Great idea, P. You can cut and paste the instructions into a document. Hope this suggestion helps. Since it is still 95 degrees in the daytime and seventies at night in Mississippi, I’m not quite ready for flannel blankets. However, these look extremely cozy for later on when and IF we ever have cooler temps. Make them now so you will have them when it gets chilly! 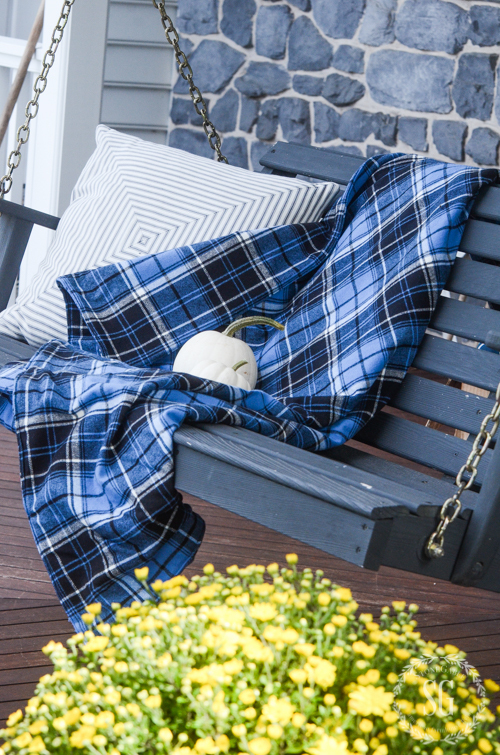 The flannel blanket looks perfect for the cool fall nights ahead spent by the firepit. I’m all in for trying one! Love the plaid blankets and your easy to follow instructions. I also live in Lancaster County. What fabric store did you purchase your flannel? Would like to buy some of that blue. Thanks for all your ideas. I found all the flannel at JoAnne’s fabric. What a fab idea!! Why didn’t I think of that? 🙂 Would make a nice holiday gift too! I love the blue flannel! And flannel feels so warm and cozy! Yvonne, such a simple thing and so pretty. A flannel blanket I was so excited…………..then I read just SEW. I can’t do that. Maybe one day I can try. I still love it. I just love this idea! This is definitely in my price range and capabilities. Thank you so much for ANOTHER great post!! Very nice! Love the blue plaid. Great idea. Thank you for bringing it to us. You’re the best! I rember how cozy the flannel sheets were that my grandmother always used in the winter, so love the idea of a flannel throw. Thank you for the happy memory. I love the feeling of flannel sheets in cold weather. But we have a temper pedic bed and even though it has cooling get it is hot! So no more flannel sheets! 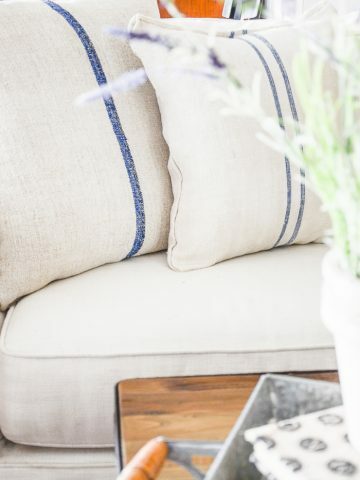 Love the blue plaid throw. Great idea! I know what I am doing this weekend! Great idea! Pillows to match! Beautiful plaid, wish My sewing machine would work! So pretty! I am going to do this over the weekend! I love your blue throw – looks lovely with your porch swing!! So cute! I wouldn’t have thought to use interfacing – great idea! Just the right amount of “body” without being overly heavy. I think I may whip up one or two! These would make cute stadium blankets for the chillier football games! (She said hopefully – it’s been so hot in TN). I am certainly pinning this post. I never thought of making flannel blankets. Now I can have the color I want with no stress of looking everywhere for a certain color. You are a genius ! Thanks for pinning Phyl. LOVE my pinners! I would love to make these, but I don’t know how to sew! Wish someone would teach me! The best way to learn to sew…. Is just to start. Buy or rent a mid priced machine from a local dealer. (New or used, support your local small sellers and repair shops) Most have free lesson to get you started and will continue to support your questions, lessons, repairs and supplies as your experience grows. Start slow…buy the best fabric quality you can afford. Cheap bargain bin fabric will be unpleasant to work with, provide poor results and you will never be happy with it. Buy only for one project at a time! I can’t stress this enough. As your skills develop your taste in fabric and quality will improve and change. Also you won’t feel guilt for having more “stuff” around. There are always sales running and you won’t miss any great buys. Use your store coupons to purchase the really expensive items, one pair fabric scissors, separate craft scissors, rulers, mats, rotary cutter, seam rubber, glass head pins, quality thread etc. Before purchasing fabrics, visit some quality dress or quilt stores if possible. Touch and pet the fabric. Yes pet… Sewers love fabric and notions. You will feel a tingle of excitement when you touch it. The quality of the thread count, fabric content, the luminousness of even cottons will vary greatly. You will feel the difference. When you are ready to buy your first fabrics, you can purchase from the bargain stores but your selection will already be more refined. You will be able to tell which fabrics are better. Start with projects that have straight simple seeing lines. Read, study, plan and measure multiple times before cutting. Enjoy the process. Start a small sample note book. Use this to plan, sketch, save samples, patterns, measurements and notes on fabrics and notions used as your reference for future projects. Lastly…just start. Some projects will work out, some won’t. It is just fabric. Not flesh and blood. You will learn with each project and pat your self on the back when it works out. Don’t be too critical of your work. Even experienced sewers have to rip out seams, throw out projects and start fresh. A lot like learning to cook I think. Enjoy the process. It is fun and rewarding. Thanks for your thoughts and info Jill, Peggy and Nancy! LOVE LOVE LOVE how our community talks to one another here! You can also take a sewing course at many fabric shops. I haven’t touched a sewing machine in many, many years but after reading your response, you have inspired me to treat myself to a new machine and start sewing again! So cozy – I can almost feel the warmth! What a great idea! Thanks for the great instructions … simple to make! Such a clever use of flannel! I would never have thought of such a cute idea for the porch. My porch rocking chairs need at least one of those. Thanks for a fun and simple idea !!!! Great idea! We are having a screened porch added to our house, so I know I’m going to need some of these! Thanks! 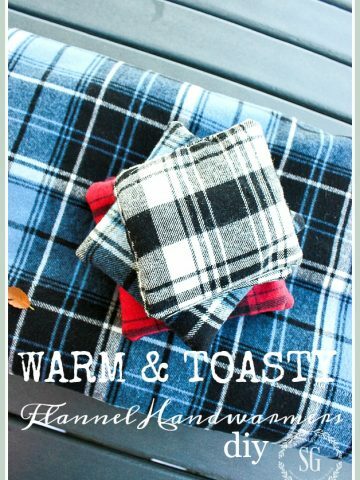 When I first read “cozy flannel blanket DIY”, my first thought was I can’t do this, I’m not a sewer! But as I continued to read the post I realized this seemed so easy. Everyone in my family have fire pits. These blankets would be perfect for Christmas gifts. I’m off to the fabric store! Thanks, Yvonne! Yvonne -Do you ever sleep? And if you do is that where you dream up all these super ideas? I can’t wait to make a few of these for indoors and out. I have the best “job” in the world! It’s always on my mind, Marilyn! Flannels and warm PJs and slippers go together. Here in TX we do not have many cool nights. It was 100 degrees yesterday. That said, I love a flannel blanket. I made a KING size single layer blanket for our bed a few years ago in a big BUFFALO check. Everyone loves it when they see it and ask where it came from. I just used 9 yards of flannel and a king size sheet as a backing. Makes a nice spread and is not too heavy to sleep under. I really do like the plaid print you picked. It is very nice. Is there such a thing as having too much Flannel ? I think not. Plaids and fall, they go together so beautifully! That looks very fast and easy ! Very pretty on the bench. Where oh where do you find the time to do all these terrific ideas? We enjoy sitting outside as well but we don’t have a fire pit so we just use our different blankets when it starts to get cold. You make it look so easy!! I love the idea of a flannel throw. I find many throws I find in the stores are synthetic and not as cozy as I would like. When we moved I trashed my 30+ year old sewing machine and have been debating getting a new one. I’m wondering if some of the simpler, less expensive machines I see would be good for something like this and sewing some pillows? I’m really out of the sewing machine loop here! Having the same situation in the past I purchased an inexpensive machine, only to discover the tension never held on lightweight materials and it would not sew thru several layers of fabric with ease. It was a waste of money. Upgraded to one that was in the midrange and have been satisfied with the machine for the simple item I mend and sew. Hope that helps. Linda, make sure you look at a sewing machine’s reviews. And thanks Carol for your info! YOU rock! Love the blue…would make great gifts! Thanks for instruction! Great idea to pick college colors in flannel and make it a Game Blanket. Thanks for tutorial. What a fabulous Idea! We are big Penn State fans so the colors of my porch swing blanket are perfect! What a great idea – love your flannel choice..
Have flannel already, so this will be my project for today! Can’t wait! Why are you using interfacing? Do you really need it? I’m using a fleece interfacing for extra warmth. It gets cold even around our fire pit! Very pretty plaid and simple sew! Thanks! We are fortunate to have a $2.99 per yard store in our town. Can’t wait to buy some flannel and make these to give as gifts. Such a great idea. I love this idea, and your choice of flannel colors. I have recently bought several different plaid flannel pieces to make capes. It is a very similar process. I can not wait for the weather to cool down so we can enjoy these goodies. Excited to try this! Great idea! Love the coziness of flannel! Perfect! Love the color and the idea! Wish I’d had these last Oct. while glamping in CO! Thanks for sharing! You have inspired me again. I know what I’m doing this weekend. Thanks Yvonne. So easy! Love the flannel plaid…thanks Yvonne! Love the idea of just using these for outdoors.